Welcome to the toyism shop! Toyism takes security seriously. Our site is SSL Verified and Secure. Make a selection above to see different products toyism has to offer. Choose between high quality fine art prints, beautiful silkscreens, unique paintings or awesome merchandise. 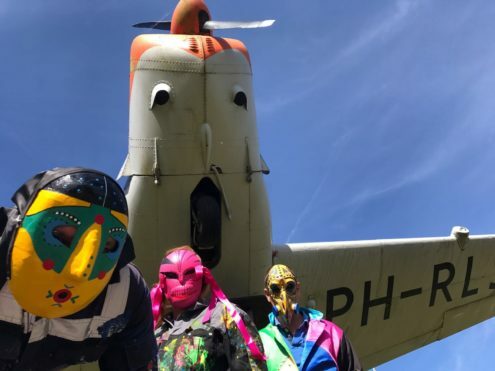 Paintings and sculptures are on display at the Toyism Studio in Villa Heymans in Groningen. Which is open from Monday till Friday from 09:00 am – 06:00 pm. Besides paintings and sculptures there are also silkscreens and giclées/piezo graphics available. Which are all signed and come in a limited edition. A gift from the toyists! if you subscribe to our newsletter! Selling price of the printed book is €45,00. Toyism is an international art movement with artists from all over the world. Toyists make storytelling, bright, colourful, contemporary art according to their secret manifesto. Which is called ‘Mother’ and describes the rules of toyism art. Each artwork created carries the DNA of the ‘Mother’ and a toyist making the art very recognizable. Together or alone toyists make paintings, sculptures and transform entire buildings into works of art. The award winning artwork from Beijing, China! Limited and signed edition! An award winning artwork! Limited and signed edition!